Origin and Habitat: Yucca gloriosa is native to the southeastern USA, from the Outer Banks of Virginia and North Carolina to Florida, Georgia and Alabama. It is also widely cultivated as an ornamental and reportedly has become established in the wild in France, Italy, Turkey, Mauritius, Réunion, Guam, the Northern Mariana Islands, Puerto Rico, Argentina and Uruguay. Commonly cultivated in the Southern USA and southern Europe, often persisting at old homesites. Habitat and ecology: Yucca gloriosa grows on sand dunes along the coast and barrier islands, often together with Yucca aloifolia and a variety formerly called Yucca recurvifolia or Yucca gloriosa var. recurvifolia. The yuccas have a remarkable method of pollination. About an hour after dark on a summer evening, they emit a beautiful fragrance that attracts the yucca moth. As the moth darts from flower to flower seeking the fragrance, it burrows against the crown of elongated stamens in the heart of the flower and so fertilises the flowers, which then produce round juicy seeds. Description: Spanish dagger (Yucca gloriosa) is an evergreen shrub or small tree forming colonies of rosettes usually with several stems arising from the base, the base thickening in adult specimens. The long sword-like leaves rising from the ground or from woody trunks up to 5 metres long are dark green, spiky and stiff and often razor-sharp, with a pointed brown terminal spine. In midsummer, huge panicles up to 2.5 m long of exquisite pendulous,bell-shaped, white flowers, sometimes tinged purple or red appear, in complete contrast to the leaves, often up to a metre long. These are so long-lasting and so striking in appearance, rich and creamy in texture and heady in fragrance, that the yuccas have long been cultivated in gardens and parks across the world as a feature plant. The fruit is a leathery, elongate berry up to 8 cm long. Yucca gloriosa is probably the most widely grown Yucca species with many cultivars, hybrids and selections. 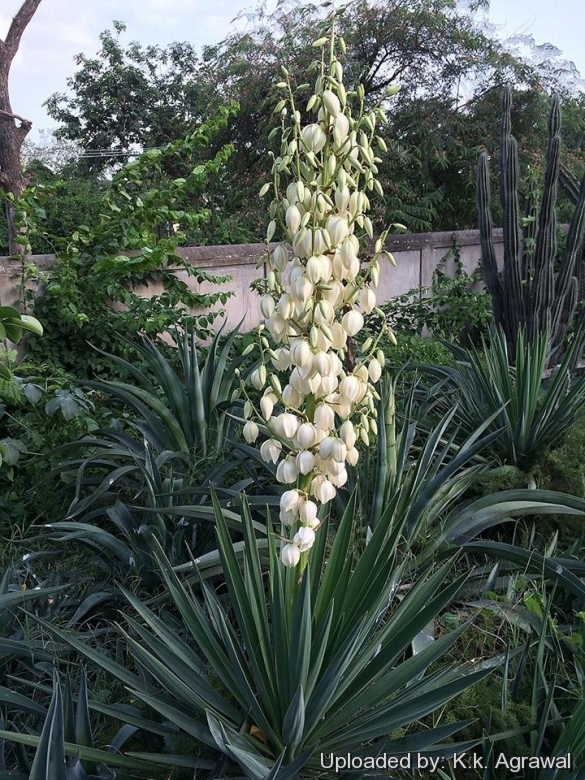 Blooming season: Yucca gloriosa flowers in late spring to mid summer. Stems: Plants stay in a stemless clump for several years, but with age a woody trunk or stem may develop and lift the leaves as high as 5 metres (usually much shorter). The stem is simple or ultimately branched. Leaves: Lanceolate or sword-shaped, flattened, mainly stiff, erect, ascending or recurved, somewhat narrowed towards the base, rigid or flexible, flat or pleated near the tip, smooth, (30-)40-70(-100) and 2-6 cm wide, glaucous when young, dark green or bluish-green when old, margins entire or rarely finely denticulate, opaque, brown, often , often becoming frayed with straight fibers, yellow or brown. Inflorescences: Paniculate, arising partly within to well beyond rosettes, large, erect, ovoid to ellipsoid 50 - 270 cm tall, to 45 cm broad, glabrous or pubescent. Peduncle scapelike, 90–150 cm long with flowers starting 40-50 cm above the leaves tips. Flowers: Pendent, globose to campanulate. Pedicels to 2 cm cm long, often arching. Tepals distinct, oblong-lanceolate, 4-5 cm long, 2-2.5 cm wide, greenish-white, cream-coloured or sometimes tinged with purple. Filaments about 2.6 cm long, anthers 3.5 mm long. Pistil light green, 3.6 cm lonh; ovary sessile, 2.8 cm long; style 9 mm long; stigmas separate. Fruits: Erect or pendent, berry-like, not fleshy and indehiscent, corky-leathery, 6-winged or 6-ribbed, 5.5 - 8 cm long. Seeds: Black, lustrous, ovate, thin, 5–8 mm in diameter, not winged. 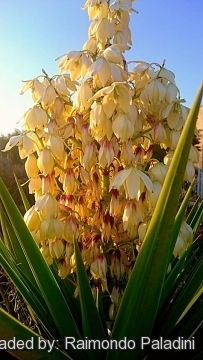 Note: Yucca gloriosa has been widely cultivated, and horticultural forms (or varieties, depending upon the source) differ in the striping of yellow and white on the leaves. There is a close relationship between this species and Yucca aloifolia, but its habitat is more mound-like due to the terminal branching mode in contrast Y. aloifolia branches from the middle of trunk thus appearing more open. Moreover Y. aloifolia has leaves with denticulate margins. Spanish dagger is a gentler plant than its cousins Yucca filamentosa (Adam's needle) and Y. aloifolia (Spanish bayonet) because the needle tips are not as sharp. Yucca gloriosa L.: (var. gloriosa) Leaf blade mostly erect, rigid; inflorescences extending well beyond rosettes; berries pendent, 5.5–8 cm. Distribution: southeastern USA, from Virginia and North Carolina to Florida, Georgia and Alabama. 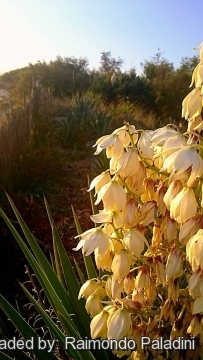 Yucca gloriosa var. recurvifolia (Salisb.) Engelm. : Leaf blade mostly recurving, flexible; inflorescences barely extending beyond rosettes; berries mostly erect, 2.5–4.5 cm. Yucca gloriosa cv. Aureovariegata: has stiff, sword-shaped leaves striped and edged creamy-yellow that blushes red in the cold months of the year. Garden origin. 3) Wikipedia contributors. "Yucca gloriosa." Wikipedia, The Free Encyclopedia. Wikipedia, The Free Encyclopedia, 9 Aug. 2015. Web. 3 Oct. 2015. 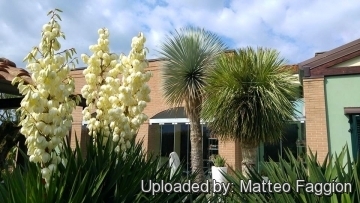 Cultivation and Propagation: Yucca gloriosa is a carefree and durable plant that become the centre of attention when it blooms, it is widely cultivated in warm temperate and subtropical climates, and valued as an architectural focal point. In a domestic environment, the plant has average water requirements, and little maintenance is needed other than the removal of dead leaves when the shrub nears its ultimate height. The plant is very hardy, without leaf damage at −20 °C , and can handle snow and freezing temperatures. It is often used as a houseplant, valued for its smooth (relatively) soft leaves, but the leaf points are even sharp enough to break the skin. The bladelike leaves add vertical structure to a cactus or xeriscape garden. This species is tolerant of drought, frost and heat. Like their counterparts, these yuccas have needle-tipped leaves, so don't plant them near play or walk areas. Soil: Plant in fast draining soil but can be established in virtually any type of soil. It is adapted to a dry environment, but has a good tolerance to moisture and humidity when planted in a well-draining soil. Waterings: Provide little or no water in winter. Treat like a succulent. However, they grow faster if watered well (don't water the crown, though they rot easily). In the garden they should be placed in a sunny, well-drained area with additional summer water (once per week or per two weeks) in dry climates. Hardiness: Best where winter temperatures stay above 0° C, but is hardy to around -10 . Plants in containers can be moved inside during longer cold spells. Maintenance: Remove dead fronds and spent fruiting stalks for a clean landscape appearance. The dried leaves - and even green ones - can be easily removed from the stem by a strong downward jerk. This is especially advisable if the plants grow near human traffic where the unsuspecting passer-by is sure to be pierced by the sharp-tipped leaves. *Garden uses: These make great specimen plants for xeriscape gardens and blend well in either tropical or arid gardens. Small plants are relatively inexpensive, but larger ones are a fortune. These make excellent potted specimens, and their symmetrical form provides a striking focal point, ans display wonderful shadows when illuminated by night lighting. In cooler climates they thrive well in gravel garden, as they have proven quite hardy because of the excellent drainage. Uses: Flowers, fruits, roots, and stems are edible. Flowers are tasty raw or cooked, and the stems can be used like asparagus. The roots can be cooked or dried and ground into a powder that can be used to make bread. Ropes, cloth, baskets, and mats are made from a fiber obtained from the leaves. Roots are sometimes used as a soap substitute. Propagation: Seed, clump divisions, stem cuttings. The species is easy to propagate from stems or truncheons.